Multiple segments of the population, including at elite level, have come together in the fight against IS and now the time has come for this effort to extend beyond the battle. 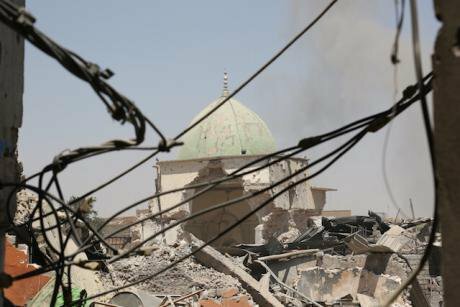 The Iraqi army recaptured Mosul's historical al-Nuri mosque and its leaning minaret on June 29, 2017. Cheng Shuaipeng/Xinhua News Agency/Press Association. All rights reserved. The territorial defeat of the Islamic State (IS) in Mosul is a significant moment for Iraq, a country that has come a long way since IS was rapidly gaining territory with such ease in the summer of 2014. This success was enabled by the fact that all sections of Iraqi society came together in the face of a common enemy – a dynamic that needs to prevail if the country is to cement IS’ defeat. IS still holds pockets of territory, with Hawija being of particular importance, but it is only a matter of time before they return to the shadows and the tactics of a non-territory-holding entity. Once they do, it will be difficult to address, as many of the structural and political failures that facilitated IS’ growth in Iraq will need to be gradually overcome, beginning with the reluctance of the political elite to enforce change. Moreover, there are a number of issues that have emerged as a direct reaction, and in response, to the rise of IS and it is these issues that need to be addressed first following their defeat. As a result of the fight against IS the Kurds have made significant territorial gains, either through taking territory from IS (for example in parts of Nineveh) or through filling the vacuum left by the Iraqi army’s withdrawal from territory (for example in parts of Kirkuk). These disputed territories have long been claimed by the Kurds, who have now taken the opportunity gained by their control of these areas to call a referendum for independence on 25 September 2017. A people’s right to self-determination is one thing – although whether they are in the political or economic position for independence can be questioned – but calling for independence for territories that have long had their constitutional status contested is another, much more problematic matter, one that is complicated by the rise of militias in Iraq. If a deal is not reached on these territories, including one on hydrocarbon management, it is possible that Iraq moves from one conflict with IS, to another conflict with the Kurds over the control of territory, reversing all the gains made by the IS defeat. In response to the Iraqi army’s capitulation to IS in 2014 a whole host of militias came to the fore in the battle against IS. However, more recently the Iraqi army has made a dramatic recovery to once again lead the fight. Nonetheless, the militias remain in place and a law has been passed that legitimises their continued existence. The multiple militias that exist in Iraq represent every fabric of society (From Shiites following Sistani, to Christians, to Sunnis, to Shiites with links to Iran) and herein lies the problem. The competition between militias that is created for the support of the population builds divides in a society that needs to come together to address the wider political and structural issues. Any notion of a common Iraqi identity is destroyed through the rhetoric used by these groups to gain popular support from segments of the society they claim to represent. With elections planned for next year and several militias closely linked or aligned to political parties, this issue becomes a larger concern, which could further hamper democratic elections in Iraq. It is therefore imperative that processes (such as disarmament, demobilisation and reintegration, as well as security sector reform) to minimise the influence of the militias and to strengthen the role of the army are put into place. A great number of atrocities have been committed during the war against IS by many different actors and it is important to acknowledge that all communities have suffered. Ensuring justice for all the communities affected by the conflict is an important step to allowing the population to move on. However, it is also important that justice goes beyond retributive mechanisms and that reconciliation is built into the process. Elements such as truth commissions should be incorporated into the justice system and there needs to be local ownership of the process in order to avoid retribution being exacted in the future. For communities to move on, the cycle of violence needs to be halted. At the same time, there also need to be de-radicalisation programmes focusing on undoing the damage caused to populations that have been living under IS for up to three years in some cases – with the youth being particularly affected. The above seems simplistic, but reconciliation in Iraq is often ignored by the government and left to civil society and it is important that this does not continue. Great physical and material damage has been caused during the battle against IS, with the recent destruction of al-Hadba minaret and the al-Nuri mosque acting as a symbol of the indiscriminate nature of the devastation. It is imperative that action is taken to repair the damage – from rebuilding the villages, towns and cities to providing basic services, such as electricity, water, medical care and education. Reconstruction should not be politicised and patronage policies and corruption must be avoided. Investment in the economies of the affected areas is also extremely important, as without jobs there can be no hope of economic security. Failure to demonstrate significant efforts of reconstruction runs the risk of alienating large sections of the population, which in turn could allow for radical entities to once again take advantage of local disenfranchisement. The majority of the issues discussed above require the political elites to come together and reach agreements for the implementation of policies. Multiple segments of the population, including at elite level, have come together in the fight against IS and now the time has come for this effort to extend beyond the battle. However, in Iraq, like other societies involving power sharing, political agreements are difficult to reach and policies are often politicised for the gains of individual factions rather than the population as a whole. Therefore, reversing the damage created by IS will be no easy task. Nevertheless, considering the fight against IS and the cooperation it fostered, and continues to foster against the IS message, the population should be able to rally once more to set Iraq back on the track of reform first promised by Prime Minister Abadi when he was elected in 2014. Failure to do so will waste an opportunity to rebuild Iraq from the ashes of IS defeat and will most likely lead to the re-emergence of similar radical entities.